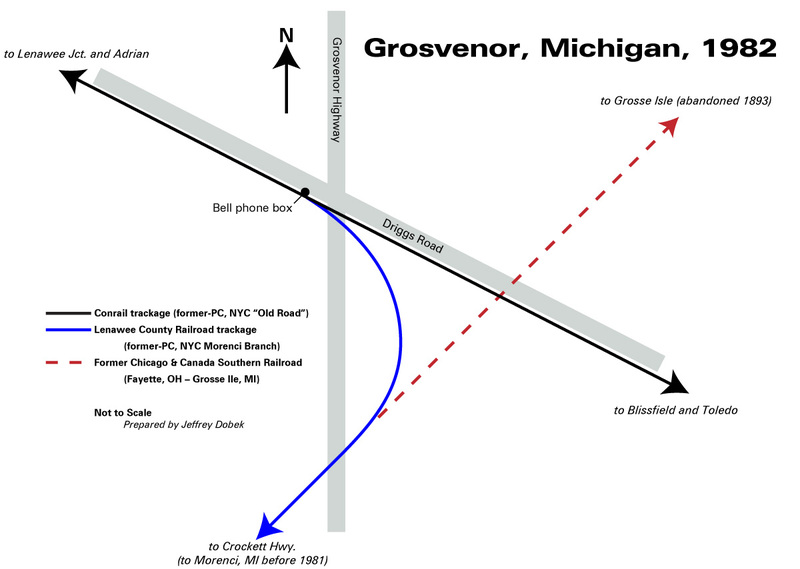 Conrail had telephone boxes at Lenawee Junction and Grosvenor, and the LCRC conductor would contact the operator at Nasby Tower in Toledo for permission to operate between the two points (via a standard “bell” telephone). 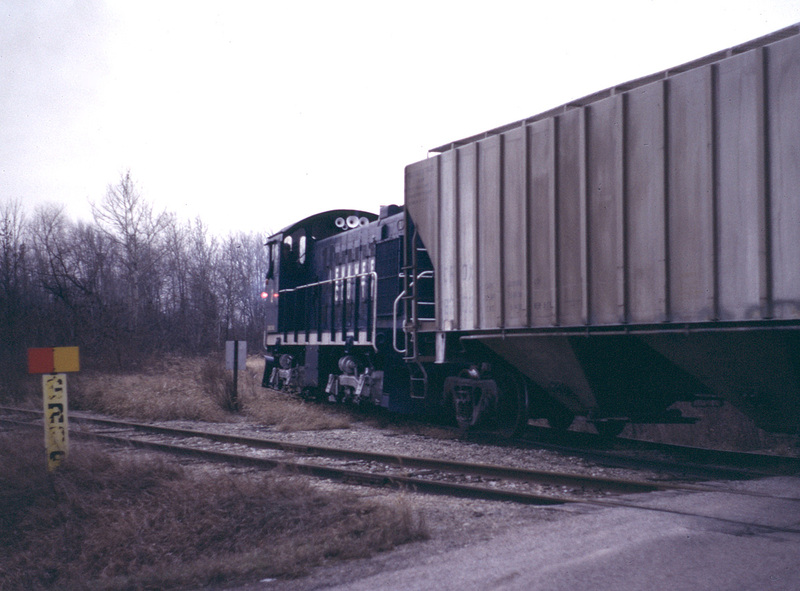 On 08 December 1982, I ran across the LCRC crew at Grosvenor with Alco S2 #2 “George Crane”. The train was returning from switching the fertilizer plant located on the Morenci Branch at US-223 and was shoving two empty covered hoppers in front of #2. 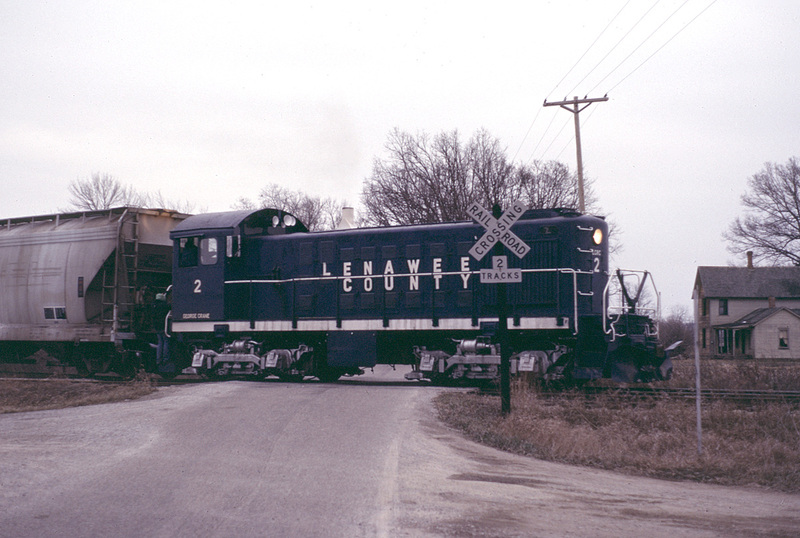 As it was 3.5 miles to the nearest run-around point at Lenawee Jct., the crew decided to do a “flying switch” to get their locomotive on the front end of the train. 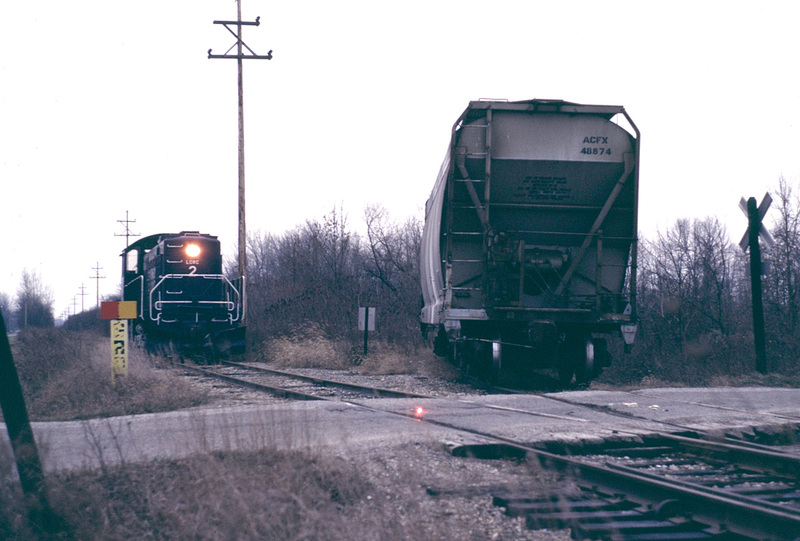 A flying switch is a maneuver in which one or more railroad cars are disconnected from a locomotive while moving and, as the locomotive pulls away, are switched to another track to roll to a desired position under their own momentum. 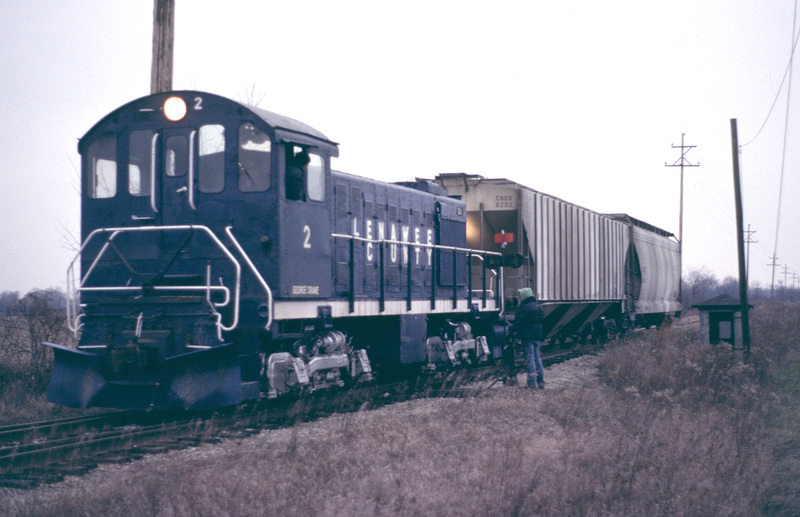 In this case, the locomotive would take the track to Blissfield, and the switch would be quickly thrown allowing the cars to roll back onto the Morenci Branch. Once in the clear, the locomotive would come back, and couple onto the other end of the cars. The series of photos below illustrate this action. 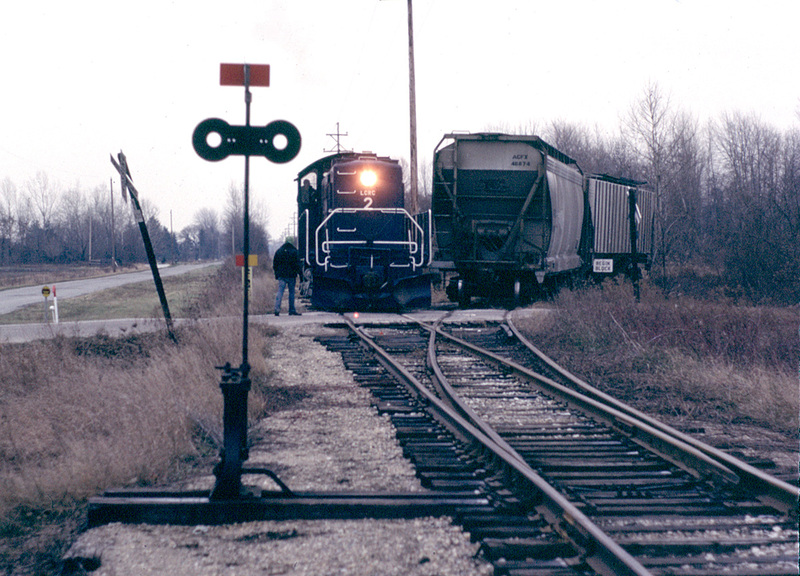 In less than a year Conrail would be gone from the line, and LCRC would operate from Lenawee Jct. all the way to the DT&I interchange at Riga. LCRC #2 arrives at Grosvenor showing two covered hopper cars. 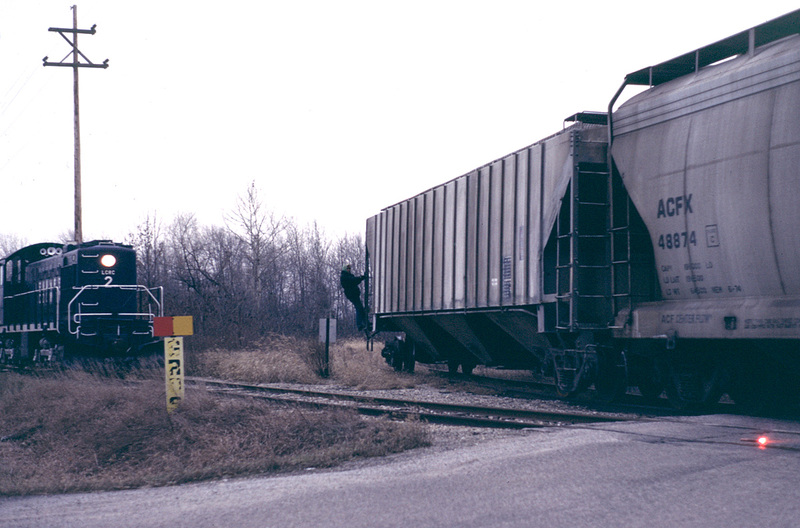 LCRC #2 has entered Conrail trackage; to the right is the phone box (later donated to the Southern Michigan Railroad Society). The conductor stands by the switch, ready to throw it. LCRC #2 has run down the Conrail “main” line, the switch has been thrown, and the two hoppers roll back onto the Morenci Branch under their own momentum. The conductor rides the cars, ready to apply the hand brake. The cars are almost in the clear, and in a moment #2 will move forward. Oops! The cars could have been rolled a bit further, as it’s a tight fit to get #2 by! #2 has backed onto the cars, and it now in the proper position to head to Lenawee Junction. 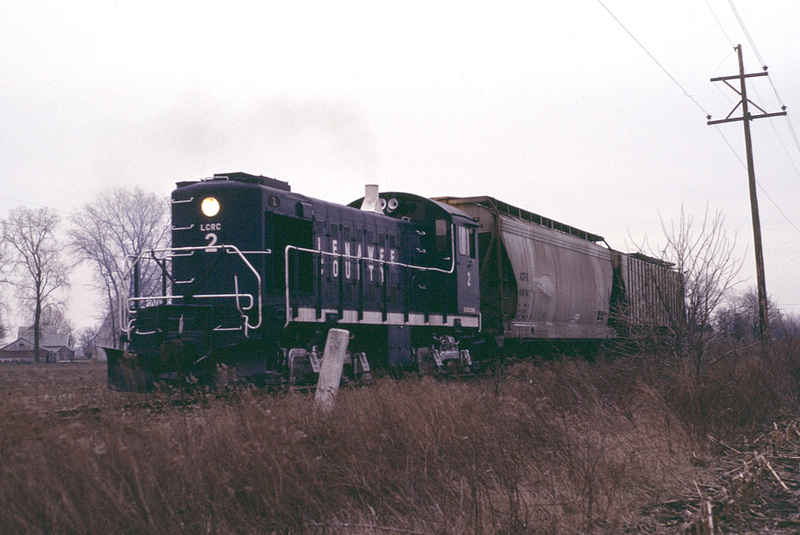 LCRC #2 and train depart from Grosvenor, heading for Lenawee Junction and Adrian. Thanks for sharing this great history. I really enjoy your posts.